Park City, Utah, played host to the FIS Nordic Combined Continental Cup opener last week, Thursday, Dec. 11 through Saturday, Dec. 13, despite balmy temperatures around 50 degrees Fahrenheit and venue changes. 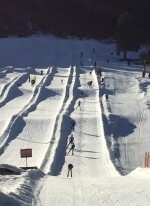 The cross-country races were moved to the Gorgoza Park tubing complex, where there was enough stocked up, manmade snow to create a 1.7-kilometer loop with “plenty of spectator-friendly hills and turns,” according to a press release. 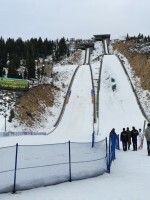 Jumping kicked off on Thursday at Utah Olympic Park with Austria’s Lukas Greiderer besting the field on an afternoon with “subtle, swirly winds,” according to a U.S. Ski & Snowboard Association (USSA) press release. 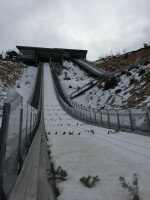 Greiderer posted the top jump of 92.5 meters on the 100-meter normal hill, followed by Germans Tobias Simon and Philipp Blaurock, respectively. The top American in his first competition of the season, Billy Demong tied Russia’s Timofey Borisov in eighth with an 84.5-meter jump, and Ben Berend notched 22nd while Taylor Fletcher jumped to 26th. 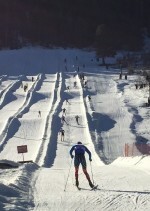 On Friday morning, Dec. 12, Greiderer started the 10-kilometer individual Gundersen at the Gorgoza Park tubing hill 4 seconds ahead of Simon and 6 seconds ahead of Blaurock. Demong started 1:02 back, followed by U.S. teammates Berend (+1:50) and Fletcher (+2:16). 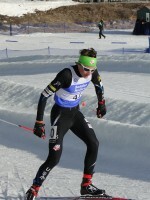 Despite what turned out to be icy conditions at the tubing park (with the 10 k races held there because of low snow at Utah Olympic Park), Fletcher ended up posting the third-fastest ski time to finish as the top American in eighth on Friday. Austria’s Tomaz Druml won it in 29:17.2 minutes after starting 40 seconds behind and posting the second-fastest time, behind France’s Geoffrey Lafarge, who improved from 28th in the jump to sixth overall. Greiderer took second, 18.7 seconds back, and Marco Pichlmayer placed third (+57.6) to complete the Austrian podium sweep. In fact, Austria occupied the top five with Alexander Brandner in fourth and Harald Lemmerer in fifth. Demong placed 13th and Berend finished 23rd, just 0.4 seconds ahead of teammate Michael Ward in 24th. 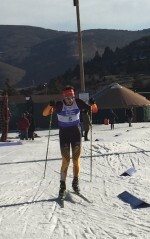 “This was perhaps the most difficult nordic-combined race I’ve done,” Demong said of the six-lap course with three hills per lap. Japan’s Yuseke Minato jumped the farthest in the second competition on Friday afternoon, giving him a 6-second head start on teammate Go Sonehara. Blaurock started 10 seconds back in third, followed by Austria’s Franz-Josef Rehrl (+14) and Druml (+24). Demong posted the best U.S. jump for the second-straight day and started the 10 k race in 14th, 1:20 minutes behind Minato. Fletcher jumped to 20th with a 1:36 starting deficit. He made it up quickly, posting the fastest time of the day in the 10 k to finish fifth. Druml raced to his his second-straight win in 26:16.9, edging Italian runner-up Lukas Runggaldier by 2.9 seconds. Minato hung on for third, 25.8 seconds behind Druml, and Greiderer was fourth (+33.9). 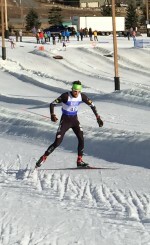 Demong placed 17th (+2:53.8) and the U.S. had four in the top 30 with Michael Ward in 28th (+3:52.3) and Colin Delaney (New York Ski Education Foundation) finishing 7.6 seconds later in 29th for his first Continental Cup points. 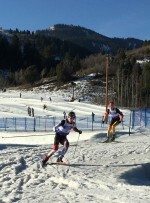 Jasper Good (Steamboat Springs Winter Sports Club) just missed the points in 32nd, Ben Loomis (Flying Eagles Ski Club) placed 35th for career bests for both skiers. 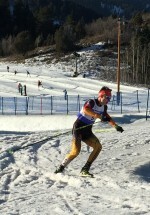 Ben Berend placed 40th. 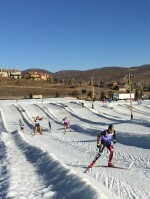 The Soldier Hollow organizing committee hosted the two-day event, and executive director Richard Hodges emphasized the amount of effort it took to pull off the competitions given the warm conditions and lack of snow. 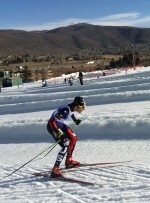 He said Soldier Hollow, Park City, Gorgoza and The Utah Nordic Alliance (TUNA) worked together to pull off the cross-country races: making snow, moving snow, and being flexible when it came to schedule changes. 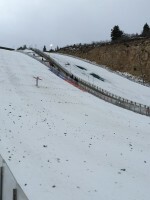 The Nordic Combined World Cup circuit resumes in Ramsau, Austria, on Saturday, Dec. 20, and Sunday, Dec. 21. Americans expected to compete include Taylor and Bryan Fletcher, Billy Demong, and Adam Loomis. 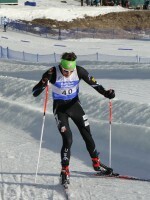 For more photos and full results see the USA Nordic Combined Facebook page.